Bengaluru’s Clarence Public School has a reputation locally in sports. Years ago, a seventh standard student with affection for running, jumping, throwing – in short, all that qualified to be the active school life – found himself on an excursion to Bannerghata, a little over 20 km from the city. By then his interest in sports had already harvested a collection of trophies – “ you know, the small ones indicative of everyone’s school days’’ – displayed at home. The student group was headed to Tulips Resort. En route, they stopped for a rappelling session. Hariprasad, the instructor, went beyond rappelling and showed some primary climbing moves and techniques to the students. Later, at the resort, there was a challenge to climb a eucalyptus tree; the prize was a box of chocolates. Praveen C.M bagged the prize. Intrigued by the boy’s natural talent, Hariprasad made him climb a couple of trees around. That paved the way for Praveen reporting to Yavanika, a state agency dealing with youth services and empowerment. Yavanika managed a 15 m-high plywood climbing wall on its premises, the only such wall in Karnataka state at that time. “ At a certain point, the wall was eight feet wide. In that width, we had four top ropes; in the portion of the wall below the top roped climbers, others bouldered. And of course, there were the belayers. It was congested but managed well. 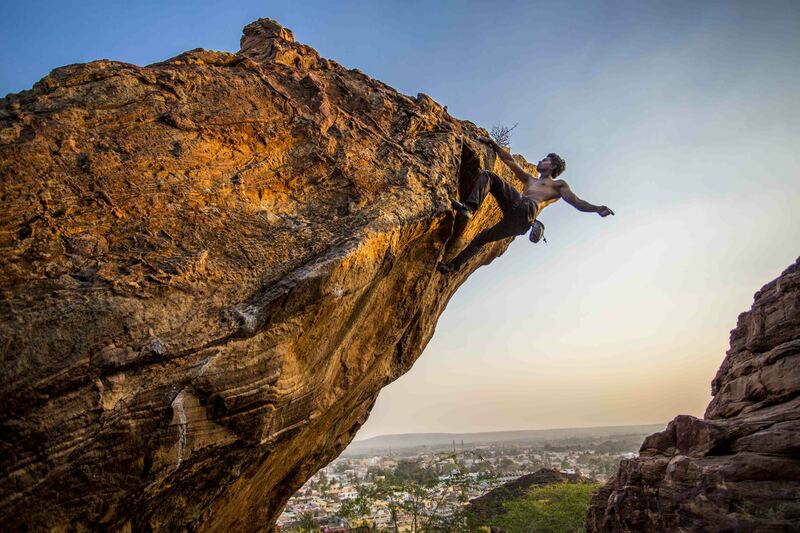 Looking back, I feel those were the days when climbing actually grew in Bengaluru,’’ Praveen said. We were at a coffee shop on the city’s MG Road. Close by was a branch of Canara Bank. 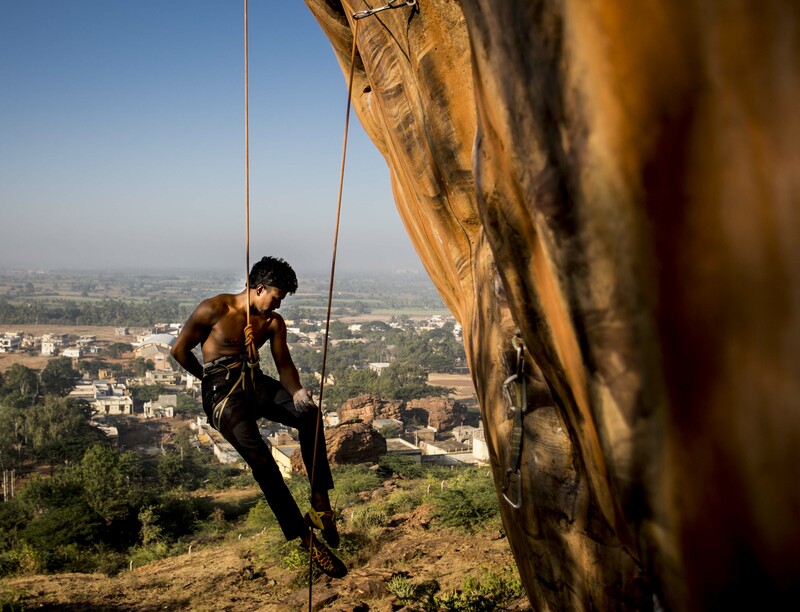 In the days Praveen discovered climbing, his father worked as a head clerk at Canara Bank. On his second visit to Yavanika, Praveen found a state level climbing competition underway. He said he wanted to try one of the routes. Indulging the school boy’s request, the organizers put him on the climbing route for women. The youngster topped it. Muniraju, who was a good climber then, saw this. He asked Praveen to climb again. Soon thereafter, Praveen began frequenting the wall and climbing with Muniraju. In the first state level competition he attended following this phase, he finished third in his age category. In the next zonal competition he placed second. By 1998, he was at his first national level climbing competition, held at New Delhi on the old wall of the Indian Mountaineering Foundation (IMF), the apex body for matters related to mountaineering and sport climbing in India. “ I still remember the crux on the climbing route in that competition. It was a move requiring considerable reach; it was at the third or fourth clip. Of the eight minutes available to climb, I spent seven figuring out what to do at this point. Eventually in desperation, I jumped for the next hold but couldn’t make it. It was a move that was tough for short people,’’ Praveen said. He is a well-built climber of modest height. That issue of inadequate reach would survive as fuel to navigate his way through climbing. It triggered two responses – first, in due course, it forced Praveen to be a dynamic climber on sport routes, resorting to lunges and leaps wherever he was challenged for want of reach. Second, it made him notice an often overlooked aspect of climbing – route setting. In India, a country with relentless rat race, the popular instinct of any alpha male is to shape environment according to his convenience. When it came to climbing routes, they were typically designed to showcase the climber who did it. In the outdoors for example, bolting wasn’t an inclusive art that took into account different body sizes and climbing styles. What’s the fun in climbing if it is to merely have rat race endorsed and one’s failures magnified? The route at the national competition intrigued. On the one hand, Praveen was encouraged by the fact that he had reached the third or fourth clip; on the other hand, his progress thereon was challenged by a move, he thought, was rather unfair given his shorter reach. It impressed upon him the importance of route setting as an art. It seemed the heart of sport climbing’s capacity for challenge and enjoyment. Soon after his first national competition, Praveen joined the group of climbers being trained by Keerthi Pais. The group was called `Manav.’ It was a tightly knit group, perhaps too tightly knit to be easily accepting of newcomers. “ It took me almost a year to be trusted and counted,’’ Praveen said. But the persistence was worth it for the climbers Keerthi trained, turned out to be good. 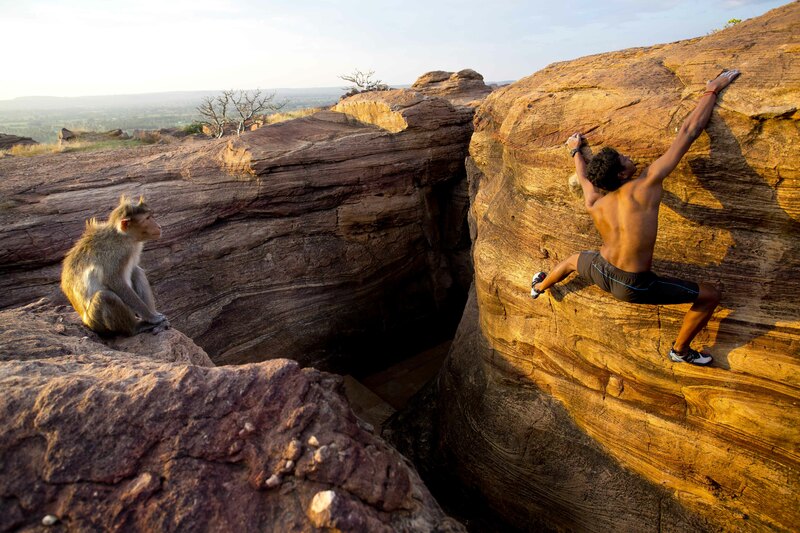 It was also an interesting time in India’s sport climbing map. The north zone was dominant; their climbers were ahead of the field. Keerthi was set to tilt the balance. “ The first medal for Manav – this one within the state – was won by Geetha,’’ Praveen said. Slowly, the group made its presence felt at the nationals through such climbers like Karthik, Archana and Vatsala. Keerthi’s group trained with commitment. Praveen recalled his life from that phase; those were the years of transitioning from Clarence Public School to Bengaluru’s National College. He stayed 18 km away from the climbing wall used for training. Those days, the city’s nascent metro rumbling overhead every few minutes near where we sat on MG Road, was not even a plan on the horizon. Buses to town from where he stayed were not many; certainly none very early in the morning. He left home at 4 AM and waited on the main road nearby for a lift. Sometimes the travel was managed in one vehicle all through to town. At other times, it was a series of lifts availed. The objective – report at the wall by 5.30 AM for the morning training session. Once training was finished, he went to college straight from the wall. College over, he returned to the climbing wall. The evening training session lasted till around 7 PM. He reached home by 9 PM. “ Buses plying on the route home would be packed with people. After a day of climbing at the wall, I would again be hanging on to something, except it was on the footboard of a bus. The routine was such that I didn’t know night and day,’’ Praveen said. He trained almost every day at the wall. In 2000, Praveen secured top honors in the junior category at the national climbing competition held in Darjeeling. With Keerthi’s wards beginning to perform well, it was now increasingly evident that the center of gravity in competitive sport climbing was shifting to Bengaluru in south India. Sport climbing was small in the country but its aficionados had a rather even geographic spread. In 2003, Mumbai’s oldest mountaineering club, Girivihar, organized an open sport climbing competition – the first time it did so. The small annual event would grow to be a much loved one, held without break thereafter for over a decade. It became the seed for the 2016 IFSC World Cup held in Navi Mumbai. 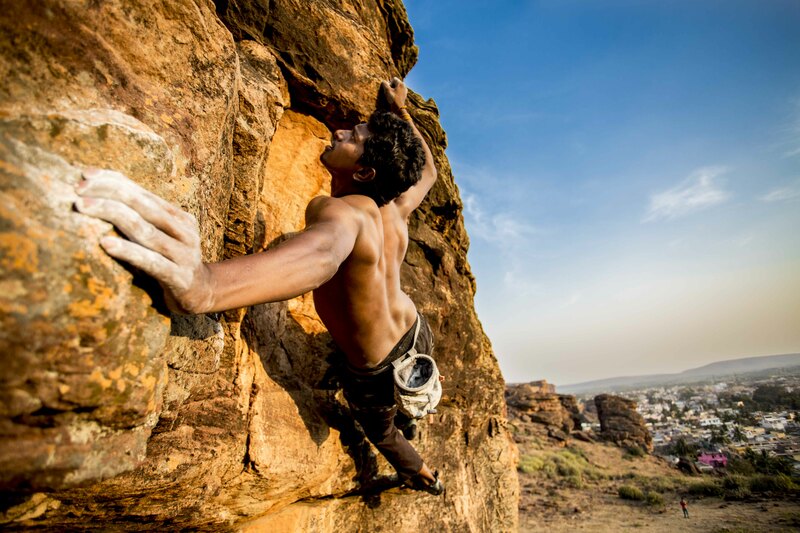 The geographic distribution and prevailing status of sport climbing in India was clear in the turnout of the competition’s initial years; climbers came from Delhi; Bikaner, Darjeeling, India’s north eastern states, Kolkata, Mumbai, Pune, Davengere and Bengaluru with Bengaluru as rising powerhouse. Around the time Praveen won his first medal in the junior category at the national climbing competition, speed climbing made its debut. In 2001, at a competition (not the national one) held in Delhi, Praveen won in both lead and speed climbing disciplines. From roughly the next year onward he proceeded to become a regular fixture among toppers at the national climbing championship. According to him, he placed first for 16 years in one discipline or the other, including in one or two years, first place across all three disciplines – lead climbing, speed climbing and bouldering. Praveen said he does not view these disciplines as disparate and instead sees them as interlinked and synergic. Helping this embrace of all three disciplines, was the solution he had evolved to compensate for his physical size in climbing – his affection for dynamic moves. 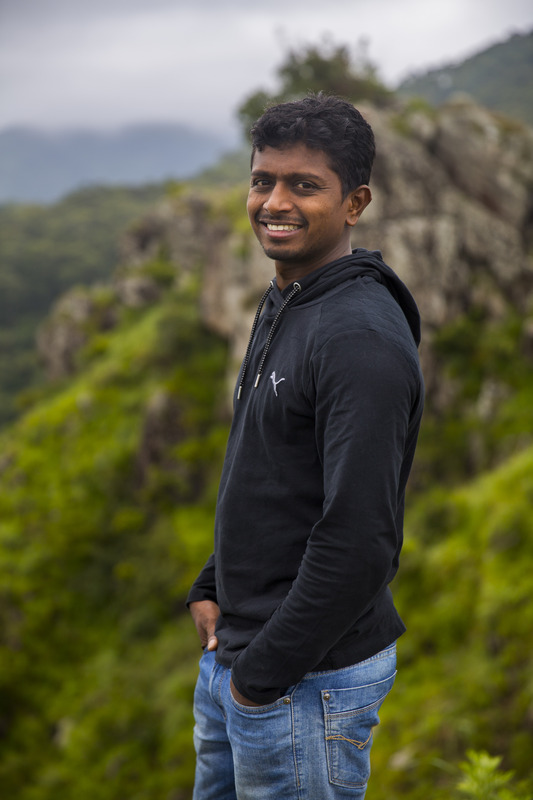 In his years in competition climbing, Praveen has represented India at international climbing competitions in several places; among them – Malaysia, China, Macau, Korea, Indonesia and France. His most recent appearance at the national climbing championship was in 2015, where he placed second in bouldering, fourth in lead climbing and qualified for the final in speed but didn’t take part. The names you hear as he recollects his years as a competition climber spans the who’s who of Indian sport climbing – Mohit, Karthik, Pranesh, Prashant, Norbu, Ganesh, Ravinder, Archana, Vatsala, Shanti Rani, Dasini, Kala, Vaibhav, Mangesh, Sandeep, Aziz, Tuhin, Somnath; all names that strike a chord with anyone who has known the sport in India for a while. He has also noticed how the larger environment in which the sport nestles, has changed. Recalling the time when potential candidates for an Indian team headed to compete in Macau were shortlisted and training was underway, he said, “ if I finished climbing a route, I would think of how I can make you do that route. Each person used to think of helping the other build competence. Such bonding is much less at present. The team spirit has faded although we have strong individual climbers,’’ he said. Distractions have also multiplied. With everyone competing to attract sponsorship, social media has become important. The emphasis is on advertising oneself, not climbing. In the process, you have more and more attitudes and impressions / illusions of self to deal with. “ I never had a sponsor. As part of a national team, yes you got the support of whoever sponsored the team. But as an individual climber, I never had a sponsor; there was nobody for the long haul,’’ Praveen said. There were also other trends, which Praveen touched upon as he reflected on the nearly two decades he has been in climbing, 16 years of that as regular topper at the national climbing championship. In Indian competition climbing, he said, both authorities and athletes have gone wrong in equal measure. “ When you go abroad to compete in an international competition, you are initially overwhelmed by what all you have heard about foreign climbers. You may also be a bit rattled by first impressions. But on closer look and after climbing with them at a competition, you come back realizing that you can bridge the gap. You also set for yourself what must be addressed to bridge the gap,’’ he said, adding, “ a big problem is – in India, we don’t invest long term. We support sports from event to event or we support an individual for one event expecting the world from him or her. When we don’t get that performance immediately, we say the person has failed; we discard that person and take someone else. That is not how it should be. Support must be sustained and long term. The result of this erratic approach is that by the time we manage to get back to an international competition, the overseas climbers have progressed by leaps and bounds from where they were when you first met them. They have a continuous calendar for competing and systematic training to back it up. We don’t. According to Praveen, athletes too have their share of emergent faults. The old dedication in training has become less. The bonding between athletes is less. Earlier, climbing was in focus. It was the only thing that mattered. Now, climbing as sport struggles to preserve its priority for athlete, in the growing matrix of smartphones; social media, fame and head-strong attitudes. Success goes to the head too quickly these days. Praveen is among those who felt disappointed by how the Indian team fared at the 2016 IFSC World Cup in Navi Mumbai. He believes that the attitude of some of the athletes and the impact that had on training, played a role in the outcome. An angle often discussed by rock climbers and sport climbers is whether the IMF with its greater familiarity of mountaineering, has what it takes to empathize sufficiently with sport climbing. Praveen said that in all these years, he came across only one senior official at IMF, who grasped the nuances of competition climbing and understood what support the athletes were looking for. Yet for all its flaws Praveen believes it is still the IMF that is best placed to manage sport climbing matters. Internationally, sport climbing moved out from the erstwhile umbrella body for all types of climbing (the UIAA) and formed its own distinct federation (the International Federation of Sport Climbing – IFSC). In India, there have been suggestions to mimic this move domestically. “ The problem in anyone trying so here is that, as yet, I have no reason to conclude anyone else has a better agenda than the IMF or will be different,’’ Praveen said. On the subject of a vigorous domestic calendar for competition climbing, he welcomed more competitions including those driven by prize money. A series of local competitions (instead of one zonal competition), strong zonal teams and all of it feeding into a national championship or a rolling series of national competitions felt wonderful to his imagination. I asked if hypothetically, leagues – on the lines of what is happening in other sports with teams composed mostly of local athletes and a few foreign athletes to improve standards, made sense. He was supportive of the idea of a league but not as supportive of foreign athletes because the gap in climbing competence between here and overseas is at present, significant. Too glaring a gap and support for domestic athletes may wither. “ What makes greater sense for me is spending the money you have for these fancy competitions, on excellent training overseas. That way you bring up the quality of local talent and reduce the gap in competence before featuring any league with foreign climbers alongside. I have a dream in sport climbing. One in which, India has a good sport climbing team that athletes wish to get into and to do so, they compete in the sport. Once they are in the team, they should feel they are part of it and that they are set to perform well. I say this because I experienced the pain. Aside from the ecosystem Keerthi created which I was fortunate to be part of, I didn’t have a dedicated coach or a sponsor despite being on the podium at the national level for 16 years,’’ Praveen said. Some time back, Praveen decided to address the old questions he had grappled with about climbing routes. He went to do a route setter’s course in Kazakhstan but on arrival there, found that the course had been cancelled. However he helped out with the Asian youth championship in climbing, which Kazakhstan was hosting. The competition’s route setter was impressed and invited him to join the route setting team for a competition in Korea. Following this stint, he did his international route setter’s course in Iran. For the two stints of work he had to mandatorily put in thereafter as aspirant route setter, he worked with a competition in Indonesia and later in May 2016, as part of the route setting team for the IFSC World Cup in Navi Mumbai. Some years ago, he also floated a company – Sportclimbing India. As of now it builds climbing walls; it is also distributor for Flat Holds, a Swiss manufacturer of climbing holds and Discovery, the Korea-based manufacturer of climbing walls. Additionally, he is training a team of climbers from Badami, Hubli, Davangere and Chitradurga. According to him, they are good, strong climbers who should soon be securing podium finishes. He is training them at his own expense. 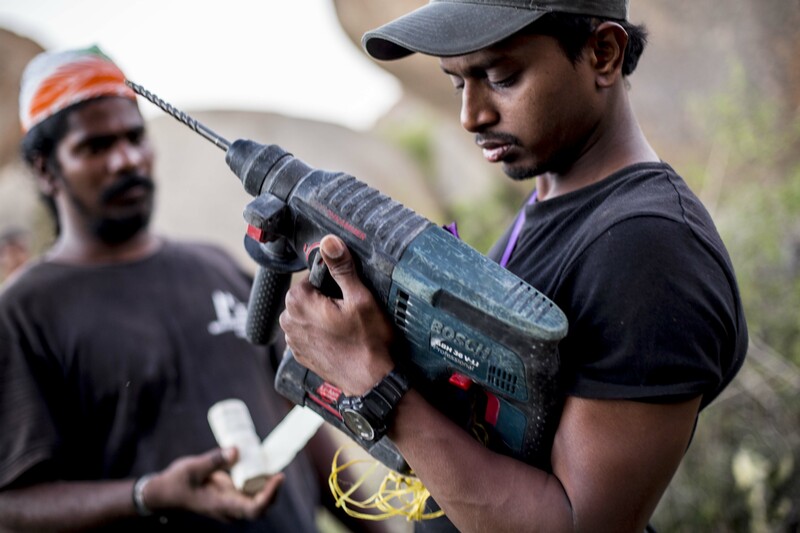 Now 31 years old, Praveen hopes that at some point his climbing wall / holds business and the team he is grooming, become synergic; that a mutually complementing ecosystem in climbing, forms. Asked why he did not explore a regular job in some other more predictable, stable field, Praveen said, “ I was so much into climbing that I didn’t know anything else. I didn’t have a back-up plan.’’ There have also been forays into other branches of climbing. In 2015, Praveen had embarked on an expedition to climb Mt Everest. He was on the mountain when the devastating earthquake of that season struck Nepal killing thousands, including damage and casualties at Everest Base Camp. The expedition had to be aborted. The seed for this digression from sport climbing into a mountaineering expedition came from a little known trip in 2012. According to Praveen, that year, a 10 member-team composed of eight army personnel and two civilians and led by a civilian – Keerthi Pais – had recorded the first ascent of a rocky peak called Zambala on Ladakh’s Siachen Glacier. “ I was the only one who climbed all through. It is now a bolted climbing route at altitude,’’ Praveen said. Sixteen floors up, Praveen’s tryst with climbing continues.